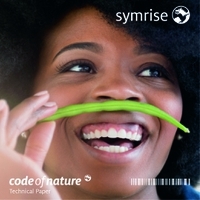 Symrise develops, produces and sells fragrances and flavorings, cosmetic active ingredients and raw materials as well as functional ingredients and solutions that enhance the sensory properties and nutrition of various products. The company’s nearly 30,000 products are mainly produced on the basis of natural raw materials like vanilla, citrus fruits, onions, fish, meat, blossoms and plant materials. The flavors, substances, perfume oils and sensory solutions are often central functional components for its customers’ end products. These customers include manufacturers of perfumes, cosmetics and foods, the pharmaceutical industry and producers of nutritional supplements, pet food and baby food. The company’s origins go back to the year 1874. Symrise has since grown to achieve a market share of currently 11 % – making it one of the leading suppliers of flavors and fragrances on the global market. A high level of innovation and creativity, an exact knowledge of customer needs and various regional consumer preferences as well as targeted expansion into new and promising market segments contribute to our company’s above-average growth rate. Today, Symrise has about 9,000 employees working at sites in more than 40 countries, serving over 6,000 customers in roughly 160 countries. Since October 2016, the operating activities of the Symrise Group have been broken down into three segments: Flavor, Nutrition and Scent & Care. The divisions within these segments are organized according to business units and regions. Each segment has its own research and development, purchasing, production, quality control, marketing and sales departments. This system allows internal processes to be accelerated. Symrise aims to simplify procedures while making them customer-oriented and pragmatic. It places great value on fast and flexible decision-making. The Flavor segment contains the Beverages, Savory and Sweet business units. Flavor’s range of products consists of approximately 13,000 items, which are sold in 145 countries. The flavorings Symrise produces are used by customers to make foods and beverages and give the various products their individual tastes. Symrise supplies individual flavorings used in end products as well as complete solutions, which, apart from the actual flavor, can contain additional functional ingredients, food coloring or microencapsulated components. The segment has sites in more than 40 countries in Europe, Asia, North America, Latin America and Africa. The Nutrition segment markets its nearly 2,000 products in 89 countries via four business units: Food, Pet Food Aqua and Probi. They deliver natural sensory product solutions for taste, texture, color and functionality in foods, beverages, and baby food based on backward integration processes for vegetables, fruit, meat and seafood. It also supplies natural-taste and acceptance- enhancing products for pet foods and sustainable marine ingredients for aquacultures. And there are also probiotics for foods, beverages and nutritional supplements with health-promoting benefits. Diana, the Nutrition Division of Symrise, reaches a turnover of €600 million and therefore accounts for about 20 percent of the Symrise turnover as a whole (circa €3 billion in 2017). Diana is organized around three business units – Diana Food, Diana Pet Food and Diana Aqua. Jean-Yves Parisot has served as President of Diana since October 2016. He has also been the Chairman of the Board of Probi AB since April 2015. Before Diana’s acquisition and integration into Symrise AG, he spent five years at the head of the Diana Food Division Business. Earlier this summer, Symrise signed an agreement to acquire Cobell, the largest supplier of processed fruit and vegetable juices in Great Britain and a leading supplier across Europe. It is now some 3 years since Symrise completed the acquisition of the French-headquartered Diana Group, one of the leading manufacturers of natural food ingredients and the global number 1 for pet food solutions. Key suppliers offer their thoughts on trends to watch in soft drinks. What is driving development and where are the unexplored NPD opportunities for creative soft drinks? Beef comes with the reputation to be one of the most important and precious kinds of meat. Symrise has launched a new generation of beef flavors and top notes for use across a range of applications. 30 May 2018 --- At the “World of Private Label” (PLMA) international trade show, Symrise presented its natural offerings for the private label business. Flavor supplier Symrise is eyeing new opportunity in the rapidly diversifying private label sector as it looks to address consumer demands and evolve towards a taste rather than mere flavor approach under the “code of nature” platform. Alexander Lichter, Vice President Sales, Flavor Division EAME of Symrise sees an evolution. “I see less and less difference between the private label and branded world. It is all about speed to market, consumer understanding and fulfilling consumer requirements at a granular level,” he tells FoodIngredientsFirst. 11 Dec 2017 --- Symrise highlighted the integration of the Diana portfolio for the first time at FiE 2017, and the joint presentation had a clear purpose. “As a company, we want to put much more focus and emphasis on the nature of our business, which is really being a natural company combined with the best of science,” says Alexander Lichter. With its heritage in mind, the company chose the motto: “Best of Nature. Best of Science. Best for You.” This means that the company’s understanding of nature, when it comes to sustainability, corporate social responsibility and the general science behind the business, is brought together for the benefit of customers and consumers. 16 Oct 2017 --- Earlier this summer, Symrise signed an agreement to acquire Cobell, the largest supplier of processed fruit and vegetable juices in Great Britain and a leading supplier across Europe. Cobell ideally complements the activities and will enhance Symrise’s local presence and customer proximity. Ben Adams discusses Cobell and how the Symrise portfolio will be expanded as a result.